The EUR/USD briefly traded beneath 11/17 lows before stabilizing as we witness a broad based strengthening of the Dollar in reaction to a dip in the S&P futures below their psychological 1100 level. The wave of disconcerting data points from the past couple weeks appears to finally be taking its toll on investor confidence. U.S. and British housing and consumption data has been disappointing lately, indicating a slowdown in the pace of their respective economic recoveries. Furthermore, although the EU data-wire has been relatively quiet this week, last Friday’s EU GDP data left something to be desired. On a positive note for the Euro, ECB President Trichet made some straightforward comments in his press conference today in regards to the ECB’s intent to start tightening liquidity. Although Trichet was a bit vague in terms of exactly which measures the central bank plans on reigning in, his language today seemed a bit more pro-active than the last ECB press conference. As a result, the EUR/USD is holding up rather well today and the Euro’s relative strength is highlighted by a solid upturn today in the EUR/GBP. Although EU data was light this week, the European Union will kickoff next week with a wave of Flash PMI numbers along with more dialogue from Trichet. Investors saw encouraging improvements in the last set of EU Flash data, particularly from France. Any further strength in Monday’s PMI numbers could combine with today’s hawkish statements from the ECB to help buoy the EUR/USD should the S&P’s present pullback accelerate. Technically speaking, we’ve readjusted our uptrend lines to account for recent weakness. That being said, the EUR/USD still has a few more solid uptrend lines sitting nearby as technical cushions should the broad-based strengthening of the Dollar continue. However, a failure of our new 1st and 2nd tier uptrend lines could result in more near-term accelerate losses since they run through November and October lows. As for the topside, recent weakness in the EUR/USD has created a few more technical barriers, including multiple downtrend lines along with 11/20, 11/18, and 11/16 highs. Furthermore, the 1.50 level continues to have a strong psychological presence. Meanwhile, investors should monitor the S&P’s ability to stay around its psychological 1100 level, for if losses accelerate the EUR/USD may follow suit due to their positive correlations. The Cable is undergoing an intense pullback today, dropping beneath all of our previous uptrend lines along with 11/12 lows. The Pound is getting hit by a report from Nationwide and an analyst poll from Bloomberg implying Britian’s housing recovery may be overdone and analysts are expecting a pullback in prices in 2010. These two discouraging news releases tack onto Wednesday’s negative Building Permits and Housing Starts data points from the U.S. Furthermore, the fact that yesterday’s British Retail Sales data printed two basis points below analyst expectations isn’t helping the Pound’s cause. Today’s bounce in the EUR/GBP highlights the relative weakness of the Pound, yet several near-term downtrend lines due remain on this major Euro cross. Meanwhile, the S&P futures have ventured back below their psychological 1100 level. Therefore, investors should keep a close eye on the S&P’s interaction with 1100 since the futures are normally negatively correlated with the Dollar. Any technically significant pullbacks in the S&P have the potential to impact the Cable with the possibility of extending the currency pair’s present pullback towards previous November lows. Technically speaking, the Cable is currently stabilizing along what is now our 4th tier uptrend line. This is an encouraging development since our 4th tier runs through November lows. That being said, these November lows serve as the next noteworthy technical support should our 4th tier uptrend line give way. 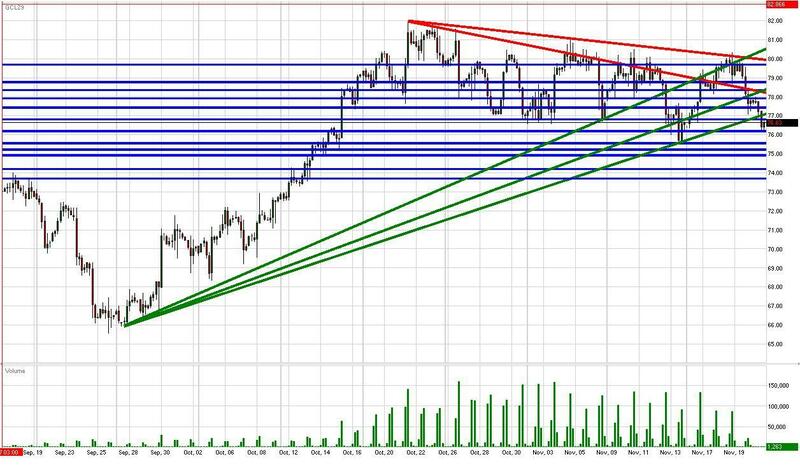 We’ve also readjusted our previous uptrend lines to give investors an idea of where important technical cushions lie. As for the topside, the Cable still faces multiple downtrend lines along with 10/29 and 11/20 highs. Meanwhile, it will be interesting to see how the Cable interacts with its psychological 1.65 area. Furthermore, investors should monitor how the S&P futures deal with their own psychological 1100 level since the futures are normally negatively correlated to the Dollar. Data-wise, investors will be paying close attention to Monday’s wave of EU Flash PMI data followed by Britain’s Inflation Report Hearings and America’s Prelim GDP on Tuesday. Tuesday’s data appears to carry the most weight for the Pound. Therefore, we should get a good idea of whether today’s setback is only temporary or signifies a more lasting trend. The USD/JPY hovered below our 1st tier uptrend line earlier today as we witness a broad-based selloff in riskier investment vehicles. Investors have indicated a preference for the Yen over the Dollar when heading for safety, meaning the USD/JPY could experience a positive correlation with U.S. equities should present weaknesses accelerate. However, today’s losses in the USD/JPY have been mitigated, and the currency pair is back above our 1st tier uptrend line as the S&P futures try to stick close to their psychological 1100 level. That being said, investors may want to keep an eye on the S&P’s interaction with 1100 since any significant technical setbacks have the potential to yield further losses in the USD/JPY. Meanwhile, the BoJ kept its benchmark rate unchanged at 0.1% and raised its outlook for future economic performance. Therefore, it seems the BoJ is comfortable with its present monetary policy. However, the DPJ voiced its concern about deflationary pressures in Japan’s economy, placing a bit more pressure on the BoJ to retain its dovish monetary policy. Therefore, it will be interesting to see how the central bank reacts should the USD/JPY test its October lows. Investors should also keep in mind that Japan’s Prelim GDP printed at 4.8% at the beginning of the week, 5 basis points above analyst expectations. Any further positive econ data from Japan combined with weakness in U.S. equities could drag the USD/JPY lower as investors select the Yen as a safe haven asset. Technically speaking, the USD/JPY is presently fighting to stay above our 1st uptrend line and the 89 level. Should our 1st tier give way, the currency pair still has 10/2 lows along with October lows serving as technical cushions. As for the topside, the USD/JPY faces multiple downtrend lines along with the highly psychological 90 level. Therefore, quite a few topside challenges are in place. Meanwhile, investors should continue to monitor the S&P’s continual interaction with 1100 since any significant technical movements in U.S. equities could have a noticeable impact on the USD/JPY. Gold is finally experiencing a period of consolidation following its incessant rise to $1150/oz. Gold is consolidating around the $1140/oz level, right along our 3rd tier uptrend lien while setting lower highs in the process. Gold’s weakness comes in reaction to pullbacks in the EUR/USD, AUD/USD, and GBP/USD. Additionally, the S&P futures have ducked back below their highly psychological 1100 level. All of these correlative forces are trimming gains and gold and allowing bulls to take a breather as investors closely monitor recent uncertainty in the FX markets. That being said, despite heavy losses in the Cable, the EUR/USD and AUD/USD have experienced what could be considered healthy pullbacks at this point. However, should losses in these currency pairs accelerate investors could opt to take further profits in gold since the precious metal tends to exert a negative correlation with the Dollar. After all, some sizable profit taking in gold wouldn’t be abnormal because it has been on a tear since breaking through $1100/oz. Meanwhile, investors are eagerly awaiting next week’s economic data, most notably housing data and U.S. Prelim GDP on Tuesday. Should global econ data continue to disappoint, investors may choose to divest from riskier assets including gold since it tends to be negatively correlated with the Dollar and positively correlated with the S&P futures. Technically speaking, we’re still hesitant to place a downtrend line on gold until we witness further consolidation/profit-taking. That being said, gold’s psychological $1150/oz continues to serve as the only viable topside technical due to the lack of historical perspective. As for the downside, gold has multiple uptrend lines serving as technical cushions along with 11/16 lows and the psychological $1100/oz level should conditions deteriorate over the near-term. The S&P futures have ducked back beneath their highly psychological 1100 level, and it seems investors are finally reacting to this week’s wave of negatively mixed econ data. Overall, despite encouraging CPI and Long-Term Purchases numbers, investors received negative housing, production, and consumption figures. Therefore, we continue to witness a slowdown in the global economic recovery. Investors have managed to keep the S&P futures above 1100 despite these data points due to weakness in the Dollar. However, the GBP/USD, EUR/USD, and AUD/USD have all reversed course today, giving investors ample reason for investors to send the S&P futures below 1100. Although, despite present weakness, the futures are trading slightly above 11/13 lows and have 10/26 lows along with our 1st tier uptrend to fall back on should technical conditions deteriorate. Our 1st tier uptrend line carries some weight since it runs through previous November lows. Therefore, a failure of our 1st tier uptrend line could indicate a retracement towards 1025 with 1050 serving as a technical cushion along the way. As for the topside, the highly psychological 1100 level becomes a technical barrier again along with 11/11 and 11/18 highs. Meanwhile, investors should keep an eye on the major Dollar crosses to monitor whether they can stabilize and recover from today’s setback. However, if the Dollar strengthens further and gold follows suit, this could imply additional weakness in the S&P futures due to correlative pressures. Speaking of which, the EUR/USD should be active on Monday with a set of EU Flash PMI data points hitting the news wires. ECB President Trichet’s press conference had a more aggressive hawk tone today, hinting that Monday’s PMI data could print strong. In addition to the PMI data the U.S. will also release Existing Home Sales. The U.S. housing market has been worrying investors as of late, so Monday’s release could have a greater impact than usual. Activity should pick up on Tuesday U.S. Prelim GDP, CB Consumer Confidence, and Fed Meeting Minutes along with a host of EU and British events. Therefore, it may not be too long until investors figure out whether the S&P futures can sustain 1100 over the near-term, or whether we witness a more protracted pullback in the markets. Crude futures have slipped back below our 1st tier downtrend and uptrend lines in reaction to broad-based strength of the Dollar. This week’s wave of negatively mixed econ data appears to be taking its toll on riskier investment vehicles, leading investors towards the Dollar and away from crude and equities. The S&P futures have sunk back below their psychological 1100 level and investor uncertainty seems to be picking up a bit. However, despite today’s weakness, crude remains above 11/13 lows and the psychological $75/bbl level. Therefore, the potential remains for crude to stabilize and lock back into the thick of its November trading range. Meanwhile, investors should keep an eye on the Dollar and gold to monitor whether we are merely experiencing a setback, or the beginning of a more extensive downtrend. That being said, investors may choose keep the technical cushions in place across the board as we await key data points such as Existing Home Sales on Monday and Prelim GDP on Tuesday. We’re headed for a data-heavy week, and investors should have enough information to determine whether more profit-taking and revaluation is in order. On the other hand, if the data prints positive, crude could easily be knocking at $80/bbl in no time. Therefore, we will keep a close watch on key technicals across the board to see whether the Dollar or equities give investors a hint in regards to where the overall market is headed.